Hampshire were left counting the cost of a failed bid to host an Ashes Test on Thursday, while in Cardiff officials were vowing to â€œrepay the faithâ€ shown in them by the England and Wales Cricket Board. There was jubilation in Welsh cricket circles as Glamorgan were surprisingly given a financial lifeline by being awarded a match in 2015 Ashes despite owing the ECB a Â£2 million staging fee from a Test earlier this summer which will now be repaid in staggered instalments. The reaction in Southampton was of disbelief as Hampshire were overlooked as an Ashes venue in 2013 and 2015, a decision which will force them to look again at the financing of their ambitious ground redevelopment. An ECB board meeting at Lordâ€™s in the morning unanimously accepted the recommendations of the major match group committee, chaired by Lord Morris. Grounds were invited to bid for packages of matches costing between Â£12 million and Â£200,000. Lordâ€™s won the platinum deal which includes two Tests per year but the real fight was over the next level of allocation featuring remaining Ashes Tests. 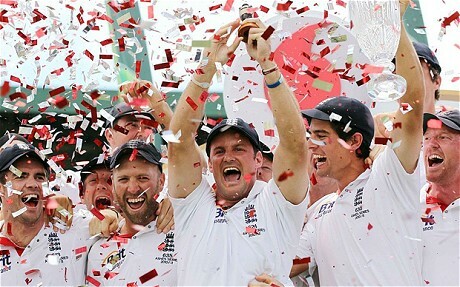 Trent Bridge was the major winner, being awarded Ashes Tests in 2013 and 2015, while Lancashire capped a big week in their history by following their County Championship triumph with a return to the Ashes rota in two yearsâ€™ time. There was disappointment at Edgbaston, where officials hoped their enlarged capacity, which means the ground seats around 9,000 more than Trent Bridge, and new grandstand would earn it two Ashes Tests. Instead they have one match in 2015. Surrey has an existing long-term staging agreement with the ECB and was not required to bid for Ashes Tests, although they have bought a package including a World Test championship semi-final in 2013. Yorkshire could not afford an Ashes Test but have a contract with the ECB guaranteeing other Test cricket between 2012-2019. Glamorgan successfully proved the impact an Ashes Test has had on cricket in Wales and that appears to have won them a reprieve, although the ECB will carry out due financial diligence on each county. â€œPrior to the award of the Ashes Test, cricket was stagnating in Wales,â€ said Alan Hamer, Glamorgan chief executive. â€œIt has been noticeable in the past few years that there has been significant increase in recreational cricket in terms of players and coaches. Just 922 spectators turned up in Cardiff on a thrilling final day of Englandâ€™s Test against Sri Lanka in May and Glamorgan face scepticism over their ability to make the longest form of the game work in Wales. The ECB described the bid process as the most comprehensive in its history, with counties using external advisers to help with bid documents which in Nottinghamshireâ€™s case ran to 250 pages. Under pressure from the counties, the ECB scrapped its blind auction for major matches but will still receive more than Â£20 million in staging fees, money which will help pay for grass-roots initiatives. Trent Bridge Awarded two Ashes Tests. Put forward a comprehensive bid and is now on a par with Lordâ€™s and Oval as a Test venue. Cardiff Expected to miss out due to recent problems and financial future now looks more assured. Old Trafford In 2013 will host first Ashes Test since 2005, a vital boost as ground is redeveloped. Rose Bowl Future now looks set to be as a one-day venue. Edgbaston Hoped to win package which went to Trent Bridge. Bristol Bid for ODIs but was only ground not to be awarded anything. 2013: Lord’s, Trent Bridge, Old Trafford, The Oval, Chester-le-Street. 2015: Lord’s, Trent Bridge, Cardiff, Edgbaston, The Oval. 2012 v West Indies: Lord’s, Trent Bridge, Edgbaston. 2012 v South Africa: Lord’s, The Oval, Headingley. 2013 v New Zealand: Cardiff, Headingley. 2014 v Sri Lanka: Lord’s, Headingley. 2014 v India: Lord’s, Trent Bridge, Old Trafford, The Oval, The Rose Bowl. 2015 v New Zealand: Lord’s, Headingley. 2016 v Pakistan: Lord’s, Old Trafford, Edgbaston, The Oval. 2016 v Sri Lanka: Lord’s, Chester-le-Street, Headingley. 2012 v Australia: Lord’s, Old Trafford, Edgbaston, The Oval, Chester-le-Street. 2012 v South Africa: Lord’s, Trent Bridge, Cardiff, The Oval, The Rose Bowl. 2012 v West Indies: The Oval, The Rose Bowl, Headingley. 2013 v Australia: Old Trafford, Cardiff, Edgbaston, The Rose Bowl, Headingley. 2013 v New Zealand: Lord’s, Trent Bridge, The Oval, The Rose Bowl, Bristol. 2014 v Sri Lanka: Lord’s, Old Trafford, Edgbaston, The Oval, Chester-le-Street. 2014 v India: Trent Bridge, Cardiff, Edgbaston, Bristol, Headingley. 2015 v Australia: Lord’s, Old Trafford, Chester-le-Street, The Rose Bowl, Headingley. 2015 v New Zealand: Trent Bridge, Edgbaston, The Oval, Chester-le-Street, The Rose Bowl. 2016 v Pakistan: Lord’s, Trent Bridge, Cardiff, The Rose Bowl, Headingley. 2016 v Sri Lanka: Trent Bridge, Cardiff, Edgbaston, The Oval, Bristol. 2012 v South Africa: Old Trafford, Edgbaston, Chester-le-Street. 2012 v West Indies: Trent Bridge. 2013 v Australia: Durham, The Rose Bowl. 2014 v Sri Lanka: The Oval. 2015 v New Zealand: Old Trafford. 2016 v Pakistan: Old Trafford. 2016 v Sri Lanka: The Rose Bowl.